What do these big blobs mean? The big, green one stands for all the journals published in neuroscience. 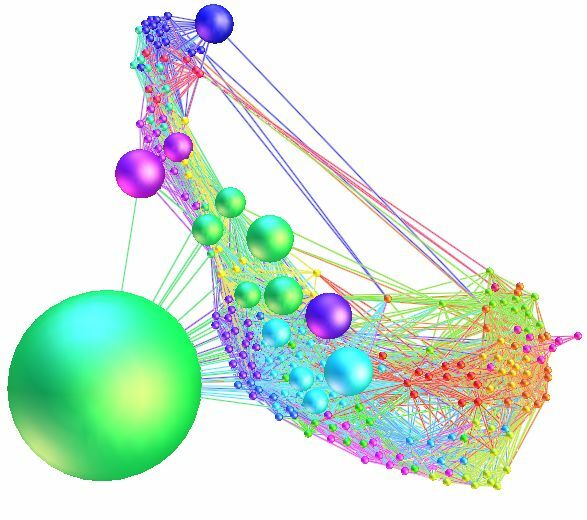 The strings connecting this blob to some other blobs in the graph represent citations. The size of the blob represents the proportion of papers in neuroeconomics published in this discipline, according to a dataset spanning 1999-2009. Not surprisingly, neurosciences is the biggest one. But, where is economics for example, and which size is it? Ok, I hope this was teasing enough (to neuroeconomists at least…): this is explained in much more details on a presentation I gave a few days ago, the slides of which you can find there. Note: if you are a neuroeconomist, a scientometrician, or a social network analyst, I am particularly interested in your feedback! Post a comment on this blog entry!